Captain Richard Willows, volunteer training officer, plays an integral part in the success and safety of everyone in the department. Continuing education is of the utmost importance to today’s responders and the training officer is responsible to make sure that all members know the responsibilities that each of them play at the emergency scene. 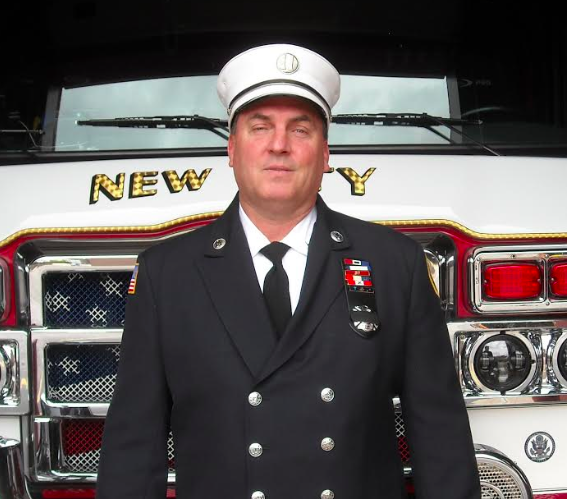 Our Unsung Hero this week is Richard Willows, Volunteer Captain and Training Officer of the New City Fire Engine Company No. 1 and member of the Rockland Regional Technical Rescue Team. The volunteer training officer plays an essential part in the success and safety of everyone in the department. Continuing education is of utmost importance to today’s responders and the training officer is responsible for making sure that all members know the responsibilities that each of them play on the emergency scene. Training on the tasks, such as personal protective equipment usage (PPE), donning the self-contained breathing apparatus (SCBA) and tool maintenance need to be addressed. “For volunteer firefighters to be good at their jobs, they must have the knowledge, skills, and abilities that are relevant to each of their job responsibilities. Training or educating is the development activity by which firefighters acquire the necessary knowledge and skills for a specific firefighter task, such as a learning session about ladders followed by the opportunity to practice this new skill at the Fire Training Center in Pomona,” Captain Rich Willows told the Rockland County Times. In many firehouses, training of volunteers involves the stair-climbing challenge in full protective clothing carrying firefighter equipment that tests aerobic capacity, lower body muscular endurance, and ability to balance. Hose-drag simulates the task of dragging an uncharged hose line from the fire apparatus and pulling it around obstacles to build upper back and grip strength. Equipment-carry occurrences require removing power tools, such as power saws from the tool cabinet on the fire apparatus, carrying them to the fire scene and returning them to the tool cabinet. Placing a ground ladder at a fire structure and extending the ladder to the roof or window and walking up the ladder in a hand-by-hand fashion tests aerobic capacity. Forcible entry lessons entail using a 10-pound sledgehammer to open a locked door or breach a wall. A search event is designed to simulate the critical task of looking for a fire victim with limited visibility in an unpredictable area. A rescue experience, using a weighted mannequin, simulates the critical task of removing a victim or injured firefighter from the scene. The pike pole, which is a long pole with a hook and point attached to one end, is used to pull down a ceiling to check for fire extension. A personal escape system (PES) gives the volunteer firefighter the capability to ‘bail out’ of an upper floor window in the face of a hostile fire without the access to a ladder or stairs. The hook can be placed at the window sill to create an anchor. This system has five components, which include an anchor hook with a hitching slot, a descent control device, 50 feet of heat and cut-resistance rope, a connection carabiner or coupling link with a safety enclosure, and a carrying pouch that fits into the pocket of the turnout-gear pants. Emergencies that require the dispatch of the Rockland County Fire Department Technical Rescue Team (TRT) pose the highest safety risks for the victims and firefighters. The TRT is responsible for safely performing rescues and saving lives in difficult and dangerous locations. These responses represent high-risk incidents that require specialized equipment and training. The trench is defined as a narrow underground excavation that is deeper than it is wide, and is not wider than 15 feet. Cave-ins present the greatest risks and are more likely to result in worker fatalities. Shoring requires installing aluminum hydraulic or other types of supports such as struts to prevent soil movements in order to extricate workers. For additional information about volunteering, call 845-634-5233 or visit www.newcityfire.org.